From the earliest days of human exploration we’ve made progressively more accurate and sophisticated maps. Maps help us find our way around the world we live in. Maps help us get to our destination. Maps keep us from becoming lost. But what if you have no destination? What if becoming lost is the point? Well, there’s a map for that. Lots of them, actually. Eric Berlow and Sean Gourley: Mapping ideas worth spreading Unconventional maps are on the mind today because today’s talk features one. TED Fellows Eric Berlow and Sean Gourley share how they created a map of the TEDx Universe — which looks a bit like an everlasting gobstopper — out of the diverse ideas expressed at TEDx events. The pair got the idea to create this map upon discovering that they had both spoken at TED conferences. 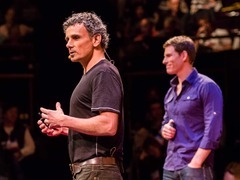 They decided to use the YouTube transcripts of 24,000 TEDx talks to pinpoint the connections that exist between them. From there, they mapped the mathematical structure that underlies these ideas. Hear more about how they created this map, and how incredible it is to lose yourself in it, by watching the talk. Here are four other maps you can thoroughly lose yourself in. The Atlas of True Names. Have you ever heard of the Mountain by the Noisy Lake? Or traveled through the Land of the Palefaces? Or visited the town of Sibling Love? The Atlas of True Names reveals the etymological origins of the names for places we see on today’s maps. Bob Dylan’s World. Every place mentioned in every Bob Dylan song, mapped. Each pinned location contains a corresponding lyric, song and album — and is guaranteed to get a song running through your head. Countries invaded by the British. Sir Ken Robinson, in his talk at our TED Talks Education PBS special, joked that the British have invaded every country they’ve ever visited. Was he exaggerating? This map suggests not so much. Geoguessr. Part map and all game, Geoguessr drops you somewhere on the planet in Google Maps street view. Your task is to figure out where in the world you are. Gather clues from things like signage, the lay of the land, architecture, vegetation or which side of the road vehicles travel on. You can even challenge your friends. Eric Berlow and Sean Gourley sharing Very useful information. These just seem so fun. Perfect for someone feeling lost to just go ahead and get lost in. I’m honestly reblogging just so I can find these again down the road and share the delight.